*Date:* Saturday, 25th of November 2017. *Venue:* Cheleku Hotel Pool Side; Opposite JAMB Office @ Amawbia Bypass, Anambra State, Nigeria. *Dress Code:* White Tan Top and Black Leggings. *Grand Finale:* Friday, 29th of December, 2017; Venue is *Anaocha Local Government Podium Premises*. For more information/inquiries, call any of the following numbers: 08163355127, 08064769501, 07015912374, 08061541410. 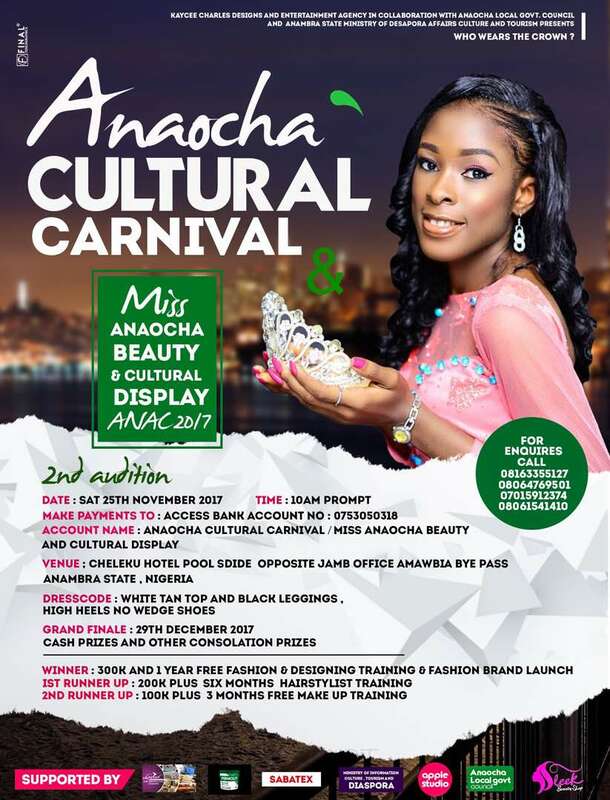 The 2017 edition of Anaocha Cultural Carnival and Miss Anaocha Beauty and Cultural Display is still open for sponsorship, partnership, and advert placements. Interested persons and firms/organization should contact any of the following mobile numbers: 08163355127, 08064769501, 07015912374, 08061541410. KEEP SHARING UNTIL IT GETS TO THE RIGHT PEOPLE. SEE BANNER FOR THE PRIZES AND MORE DETAILS. LET US PROMOTE OUR CULTURAL HERITAGE. A PICTURE OF THE BIG BOY DISTURBING ONITSHA TAGGED "ONITSHA HUSHPUPPY"